Model F3QR80 Dry sprinklers are quick-response, standard coverage sprinklers with a nominal K-Factor of 8.0 (115 metric). Model F3QR80 Dry sprinklers all use a 3 mm glass bulb operating element. See the Temperature Ratings table in this Bulletin for available temperature ratings. 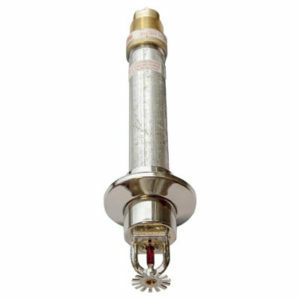 Model F3QR80 Dry sprinklers are intended for installation on wet-pipe, dry-pipe, or preaction sprinkler systems in accordance with NFPA 13. Model F3QR80 Dry sprinklers are available with a variety of escutcheon options as illustrated in Figs. 1 through 3 and Figs. 5 through 7. 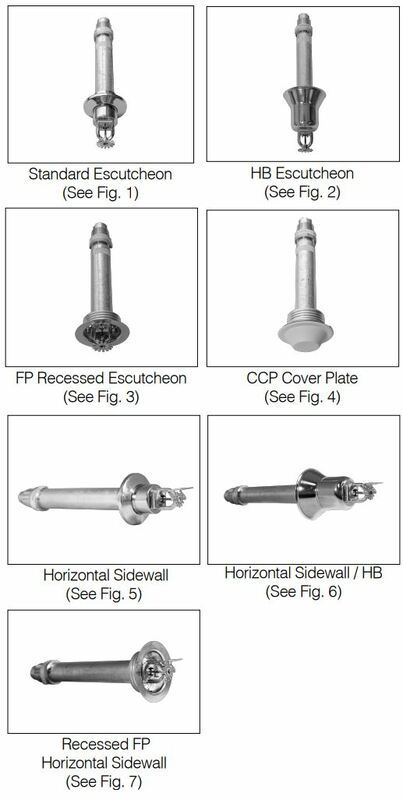 In addition, Model F3QR80 Dry Pendent sprinklers are also available with the Model CCP conical concealed cover plate as illustrated in Fig. 4. 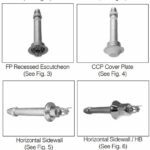 Available sprinkler, escutcheon, and cover plate finishes are identified in the Finishes table in this Bulletin. The Model FP escutcheon, and Model CCP cover plate are the only recessed escutcheons and cover plate listed for use with Model F3QR80 Dry sprinklers; the use of any other recessed escutcheon or cover plate with Model F3QR80 Dry sprinklers will void all guarantees, warranties, listings and approvals. Inlet fittings are available with 1” NPT or ISO 7-1R1, threads. • Concealed Pendent with Model CCP cover plate.